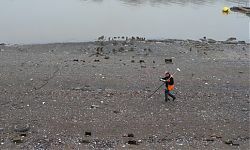 Since the Thames Discovery Programme began in October 2008, we have run eight cycles of FROG Training, and over the weekend of 21st / 22nd May, the number of FROG members grew to over 300 as the most recent group of trainees attended fieldwork at the Greenwich Palace foreshore. The foreshore at Greenwich is well known to the TDP Team (it’s my second favourite site after Chelsea! ), and we have revisited it many times during the lifetime of the project. The foreshore here is very dynamic and new features are constantly being exposed (and others disappearing….). 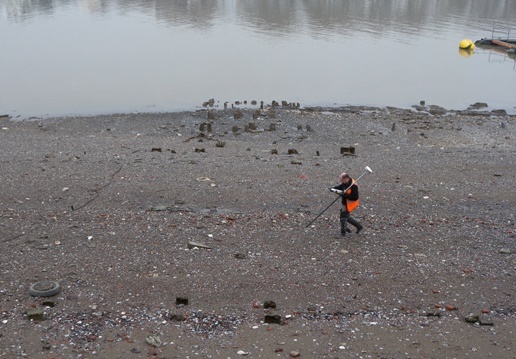 We have been focusing on two areas of the foreshore at this site; the remains of the probable Tudor jetty, as recorded by the Thames Archaeological Survey in the 1990s, and the recently exposed structure nearer the stairs which is likely to be of medieval date. We have been pondering the archaeology exposed in both areas, and think we might have worked out what was going on (but we reserve the right to change our minds!!). 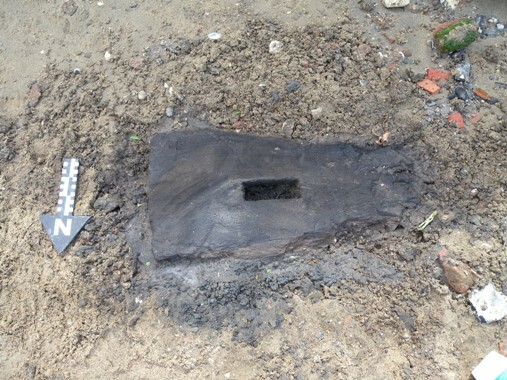 In the area immediately north of the Bellot memorial, the timbers recorded by the TAS have reappeared and these piles may represent a jetty structure of Tudor date, projecting out from the western end of the palace complex, as originally interpreted. What has always puzzled us about the base-plates recorded nearby by the TDP is that while they have mortises, they largely appear to lack any tenons to ‘fix’ them to the foreshore, so we are now speculating that these timbers are recycled from elsewhere and used to create a foreshore surface or possibly a slipway (rather than a formal jetty), together with the dumps of artefacts noted in the immediate vicinity. 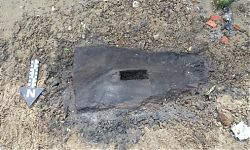 Moving eastwards, the timbers recorded in front of the Charles II building present us with another puzzle. The U-shaped jetty structure recorded last summer appears to date to the 12th century, and a closer examination of the timber piles below this structure also suggested that these are older than we previously thought – don’t be misled by the 20th century chain lying on the foreshore near them (like we were). These piles could also be medieval but could they even be Roman?! The only way to know for sure will be to take some samples for radiocarbon dating – which we hope to do this summer……watch this space for further news!